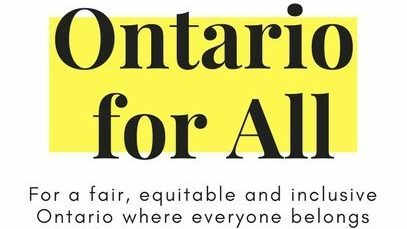 We are calling on all leaders to make Ontario a fair, equitable and inclusive place where everyone belongs. Too many Ontarians live in poverty and too many are struggling to make ends meet. Ending poverty is everyone’s business. It robs people of their potential, costs us all too much, and undermines what we stand for: a place where everyone has a fair chance at a good life. We call on all elected MPPs to commit to end poverty, reduce gender, racial and income inequality, and create an Ontario where everyone has hope for a brighter future. Action should be grounded in meaningful reconciliation with Indigenous peoples. It must address the realities of those most harmed: Indigenous peoples, peoples of colour, women, immigrants, LGBTQ2S+, youth, seniors and people with disabilities and/or facing mental health challenges. When governments act with purpose, progress is possible. Build an economy with fair and equitable opportunities and decent work for all. Create pathways out of poverty by ensuring that everyone has income security and the supports they need to live with dignity. Ensure affordable, appropriate and safe housing is available to all. Invest in inclusive, healthy communities with affordable and quality childcare and public education, pharmacare and dental programs, transit and transportation, and community programs and services. Our broad coalition includes people with lived experience, community agencies, social justice and faith groups, the labour movement, non-profits, racial justice groups and employers. We worked together throughout the 2018 Election and are continuing to engage elected MPPs and Ontarians in this call to action.